Anthony Dirrell reclaimed his WBC Super Middleweight World title with a hard-earned technical decision win over Avni Yildirim in the main event of an exciting PBC on FS1 scrap. Anthony Dirrell becomes a world champion again—winning a hard-earned technical decision over Avni Yildirim, after an accidental headbutt forced their exciting PBC on FS1 scrap to go to the scorecards in the 10th-round. Dirrell vs. Yildirim: Will the Dog Have His Day? Anthony “The Dog” Dirrell may end up in a dogfight versus hard-hitting Avni Yildirim of Turkey when they throw down tomorrow on PBC on FS1. The former super middleweight world champion overcame cancer to return to boxing. Now he must overcome Avni Yildirim to become world champion again Saturday night on PBC on FS1. A battle with cancer and a motorcycle crash that left him with a broken arm and leg haven’t kept unbeaten Anthony “The Dog” Dirrell from winning a world championship at 168 pounds. One of two brothers making their living as a fighter, Dirrell’s aggressive style has helped him overcome challenges both inside the ring and out. The 168-pounder has survived non-Hodgkin’s lymphoma, battled back from a motorcycle crash that broke an arm and a leg, and mistakenly been arrested for an armed bank robbery. He’s also stepped out of the shadow of his older brother, Andre, a talented fighter who won a bronze medal at the 2004 Olympics. Anthony Dirrell fights Marcus Johnson at the U.S. Olympic trials in Tunica, Mississippi, in February 2004. Anthony Dirrell was born in the tough town of Flint, Michigan. The Dirrell brothers started boxing in elementary school with their grandfather, Leon "Bumper” Lawson Sr., and uncle, Leon Jr., guiding their careers as trainer. The elder Lawson was a former sparring partner for Muhammad Ali. Dirrell’s 192-20 amateur career included moving up to the 178-pound weight division for the 2004 Olympic trials, while brother Andre fought at 168. He fought with a broken hand, but finished third and didn’t make the team. Anthony Dirrell hits Billy Thompson with a right during their fight in Los Angeles on September 2, 2006. Dirrell made his professional debut at the age of 20, gaining a first-round TKO of Henry Dukes on January 27, 2005. Over the next two years, Dirrell racked up 11 more wins, including a first-round TKO of James Hopkins on December 22, 2006, in his hometown of Flint. Just days later, he received the biggest blow of his life: Chest pain he’d been experiencing during training was diagnosed as non-Hodgkin’s lymphoma, a cancer that starts in cells in the body’s immune system. Dirrell underwent two years of chemotherapy, but kept up his training between treatments. Before resuming his boxing career, though, Dirrell was pulled over on his way to chemotherapy on suspicion of armed robbery. The suspect was driving a car similar to Dirrell’s, and the boxer spent a night in jail. He was released the next day, and no charges were ever filed. Anthony Dirrell takes a break during training in 2013. Dirrell returned to the ring on October 11, 2008, after a nearly two-year absence, defeating Andy Mavros in a four-round unanimous decision in Las Vegas. He continued his undefeated streak with 11 more wins, earning him a 168-pound contender eliminator match with Renan St-Juste on December 2, 2011. Dirrell defeated the Canadian by fourth-round TKO. In position for a title bout, Dirrell suffered another setback in May 2012 after being struck by a vehicle while test-driving a motorcycle. The crash left him with a fractured arm and broken leg, sidelining him for nearly 18 months. Anthony Dirrell does a backflip after knocking out Anthony Hanshaw in San Antonio on July 27, 2013. In his first bout after the accident, Dirrell won an eight-round unanimous decision over Don Mouton in Las Vegas on May 3, 2013. Two months later, he dispatched Anthony Hanshaw in three rounds in San Antonio, putting him within reach of his goal of becoming the first cancer survivor to win a boxing world championship. Anthony Dirrell punches Sakio Bika during their 168-pound title fight in Carson, California, on August 16, 2014. Dirrell got his shot against champion Sakio Bika on December 7, 2013, in Brooklyn, New York. 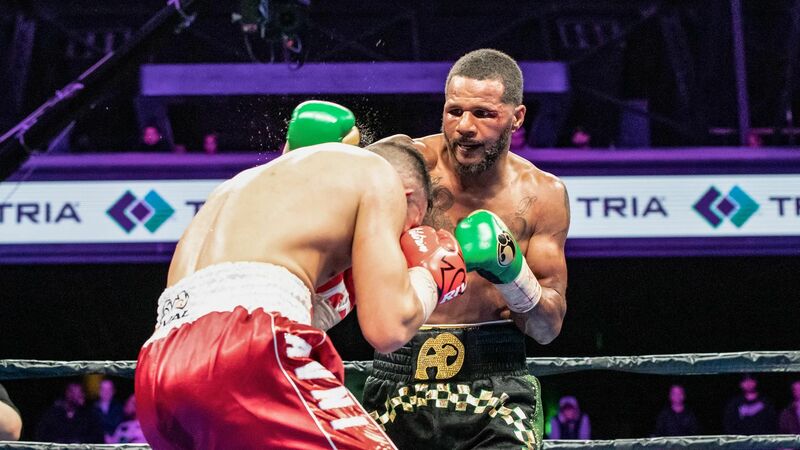 Dirrell dropped Bika in the fifth round, and Bika was docked a point in the 11th round for a low blow, but the action-packed 12-round fight was ruled a draw, allowing Bika to retain his title. Dirrell and Bika met in a rematch in Carson, California, on August 16, 2014. Dirrell relied heavily on his defense to outbox Bika in another rugged fight, winning the 12-round brawl by unanimous decision to take the 168-pound title. He just missed his chance to become the first known cancer survivor to win a world championship, as Daniel Jacobs, who overcame bone cancer, won a 160-pound title one week earlier. Anthony Dirrell lands a right hand during his loss to Badou Jack in Chicago on April 24, 2015. Dirrell put his title on the line on April 24, when he faced challenger Badou Jack in Chicago in a Premier Boxing Champions bout that was broadcast on Spike TV. Dirrell was the aggressor early on, and switched to southpaw in the fourth round in an attempt to thwart Jack. Jack picked up the pace in the middle rounds, though, and pressed Dirrell for the remainder of the 12-round bout. Dirrell tried to rally late, but it wasn't enough as Jack won a majority decision by scores of 116-112, 115-113, 114-114 to take the title. After losing to Badou Jack in April 2015, Dirrell went on a three-fight winning streak. He won almost every second of every round in a unanimous 10-round decision over veteran Marco Antonio Rubio on September 6, 2015, at the American Bank Center, in Corpus Christi, Texas on a Premier Boxing Champions card on CBS. Seven months later, Dirrell needed a mere 109 seconds to stop Caleb Truax on April 29, 2016, in the first round at the Trump Taj Mahal, in Atlantic City, New Jersey, on Spike TV. It marked Dirrell’s first stoppage victory since he beat Anthony Hanshaw by third-round TKO on July 27, 2013. Dirrell made it three straight by beating Norbert Nemesapati with another stoppage, a sixth-round TKO on January 13, 2017 in a Premier Boxing Champions fight on Spike TV at the Hialeah Park Racing & Casino, in Hialeah, Florida. Dirrell's next fight will come in his hometown when "The Dog" takes on Denis Douglin on Friday, November 17, 2017 from the Dort Federal Credit Union Center in Flint, Michigan. The bout will air live on FS1 at 10:30 p.m. ET/ 7:30 p.m. PT.